I think the beauty of this release is not just the songs but the way that Eric talks with so much passion plus the fact that it is raw blues- enough said I think. Great one by the master himself .Brought life to the old ones. Excellent guitar & background. Truly a session for Robert J. Me and Mr Johnson was an outstanding CD, possibly his best blues CD ever. The problem with me and Mr. Johnson was that it did not have some of my favorite Robert Johnsons songs on it. "Sweet Home Chicago" and "Love in Vain are two of my favorites. Me and Mr Johnson had a version of "Love in Vain" but, if you get the DVD/CD combination and you watch him play it live. In my mind his performance is at least as good if not better than the version the Rolling Stones did in the early 70's. I would recommend that you get the DVD/CD combination. There is something almost spooky about watching Clapton record in the same studio that Johnson made the original recordings in many years ago. The combination of Clapton and Doyle Bramhall is nothing short of inspiring for any blues lover. If this don't make you love the blues, nothing will. File this under "O" for extraordinary. Not only one of Eric's best, but one of the finest blues records ever made..........enjoy. Now THAT'S what I'm talkin' about! After I was finally able to listen to the CD (it didn't play on my CD player due to the copy-protection!) 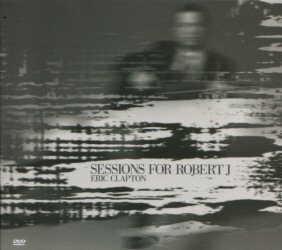 I have been absolutely delighted with "Sessions for Robert J". It is everything that "Me and Mr Johnson" wasn't: raw, painful, edgy and gritty. The DVD is particularly stunning. The acoustic version of "Hellhound on My Trail" and the unpolished "Stones in My Passway" send shivers down my spine every time. The entire CD/DVD combo is a dream come true, with versions of "Terraplane Blues", "Ramblin' on My Mind" and "Stop Breakin' Down" (just to name a few) that cut right to the bone. Johnson's music and Clapton's genius is merged together into a wholeness that presents a timeless snapshot from the very depths of the human soul. This should be required listening to anyone. Basically, my words can't make justice to this one. I rate it as a full 10.